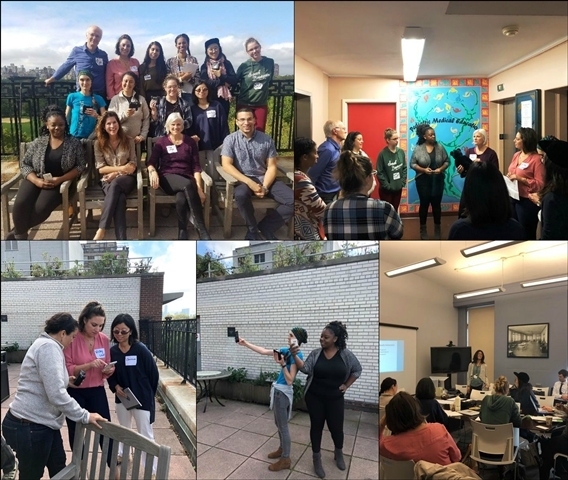 On Oct. 14th, Mount Sinai CEC staff, Children’s Environmental Literacy Foundation, and Anthony Negron from the NY Hall of Science, led a one-day course titled “Citizen Science and Environmental Health in your Community ” a professional development session for NYC middle school teachers. The project was funded through the New York State Pollution Prevention Institute (NYS P2I) Community Grant Award which will allow for CELF, CUNY, NYC DOE, and the Mount Sinai CEC to engage NYC public school students as environmental health researchers to collect and analyze air pollution data from their neighborhoods. During the workshop, the middle school teachers were introduced to the principles of Education for Sustainability and pedagogy of Citizen Science. Anthony Negron from the NY Hall of Science presented on the protocol for the AirBeam monitor and AirCasting app—teachers will then train their students to measure air quality in their school communities at different times of the day and different times of the year. The Mount Sinai Community Engagement Core led the Environmental Health and Civic Engagement portion of the workshop. Maida Galvez presented on the impact of pollution in relation to human and environmental health and Luz Guel presented on the role of research in environmental justice communities. Through this training, teachers will begin to work with their students to create pollution prevention plans that can inform public health interventions that promote healthy communities. This entry was posted in Feature of the Month on October 19, 2017 by mountsinaitceee.